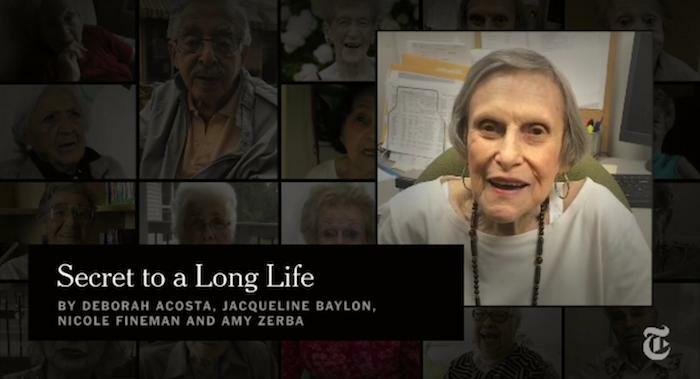 I stumbled upon this uplifting video featuring New Yorkers over the age of 85 talking about the secret to a long life. This is the kind of thing you need to see/hear regularly. These are some of my favourite answers. "The secret to a long life is to be engaged with life." "I colour my hair, wear make up and flirt with only the cute guys and I always take the stairs." "Have a curious mind, and that is the one thing that is important when you get old." "Be aware of the pleasure that you get when you give something or do something for people that really need it." "Good family and at this time of life, good friends." "....try to be happy, which is not easy." The video is from a New York Times article, The Wisdom of Old Age featuring men and women talking about old age. Watch the video and read the complete article here. A paradox of old age is that older people have a greater sense of well-being than younger ones — not because they’re unreservedly blissful, but because they accept a mixture of happiness and sadness in their lives, and leverage this mixture when events come their way. They waste less time on anger, stress and worry.